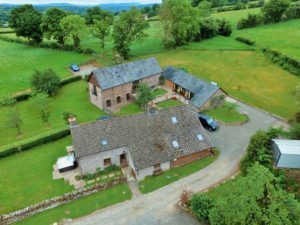 Holt Farm Holiday Cottages are set in the country near Hay-on-Wye, the Black Mountains and Herefordshire’s Golden Valley. 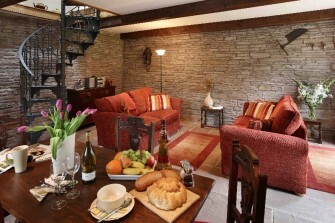 There are four cottages that sleep a variety of number of people or can be booked as a whole to sleep a party. We have tried to provide as much information as possible in this statement, if you do have any further queries please do call. We look forward to welcoming you. We have a website that enables you to be able to see what Holt Farm Cottages has to offer you our guests. You can also see more detailed images of the property on the website. Bookings / enquiries can be made via e-mail or phone. The nearest towns are Hay on Wye, Hereford or Abergavenny where there are buses and all local amenities. Taxis are available from Michaelchurch Escley, numbers are available at the cottages themselves. There is also a local bus on a Wednesday to Hereford city. Shopping can be delivered for your arrival either through Tesco, Sainsburys, Asda or Waitrose. All the cottages are accessible from their individual car parking areas immediately in front of the accommodation. The parking areas are uneven and gravelled. There is smooth paved parking in front of the Wain house. There is plenty of space for parking a number of cars with space to get in and out of the vehicles easily. The front entrance is approached by a paved driveway and the doorway is 96cm wide with no step. The door goes straight into the living room which is furnished with movable furnishings of 2 x 3 seater sofas, coffee table and tv. This room has a door that exits through a door 90cm onto the courtyard with a 13cm step. There is sufficient room to move a wheelchair around the room. In the kitchen there is a table of 78cm high, with a knee height of 66cm and width of 151cm. Accessed through a doorway 85cm from the hallway approached by the kitchen with a doorway 81cm. This room is in the style of a wetroom. Shower controls are 125cm high. Grab rail on wall. Sink is in the style of a base unit on legs with counter-top sink and single lever high rise mixer, sprung plug basin waste. There is 30cm of free space between uprights on the base unit. The counter top surface is 70cm above floor level and the basin rim is 85cm above floor level. Toilet 41cm high, also available is an Aquatec fixed toilet seat, height adjustable with integrated armrests. The hallway outside the bathroom has an external door 92cm wide leading into the courtyard with a ramp and rail or 4 steps leading to gravel. Accessed through a door 84cm wide. External access to the sun terrace with double doors 130cm wide. 2 x single beds 217cm long by 95cm wide with a gap of 90 cm between them, or 1 super king bed with spaces of 45cm on each side with 190cm at the foot of bed. 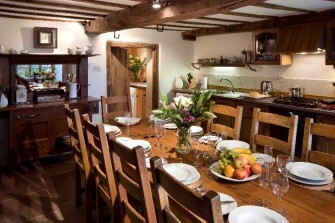 The cottage is approached with a 16cm step into the front door 82cm wide, straight into the kitchen. Long narrow kitchen with a breakfast bar and the boiler room at the end of the room. The breakfast bar is 92cm high, 43cm wide with stools 64cm high. Sink 100cm high and 51cm wide. Washing machine and dryer 82cm high. Spaces either side of the bed of 80cm on the left and 160cm on the right and 210cm at the foot of the bed. There are two entrances, one from the car parking area 111cm or from the courtyard 112cm. Large table in the centre of the room 76cm wide 275cm long, spaces of 90cm at the top, 106cm at the bottom, 105cm right hand side and 142cm left side of the table. Sink, counter height 55cm back from counter edge. Double bed 145cm wide, 190cm long with a gap of 61cm on the right, 156cm on the left and 123cm at the bottom of the bed. Double bedroom bed 140cm long and 201cm wide with space of 70cm on the right of the bed and 55cm on the left. The room also has a single bed. 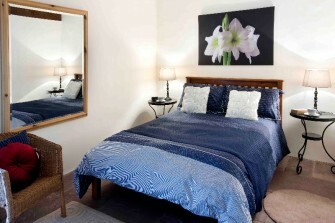 Double bedroom 140cm wide, 201cm long with space on the sides of the bed of 61cm on the right and 90cm on the left. There are washing machines and dryers in all the properties. All are front loading. There are airers available in all the properties. There are many local maps and information on local attractions available at the cottages. All cottages have an internal telephone for guest use. The system used is Voice over internet calls. 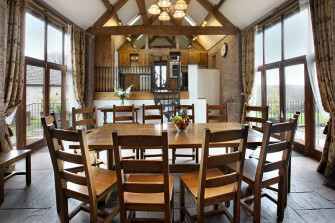 All cottages have a broadband internet connection, a password is used in one cottage -The Stable.